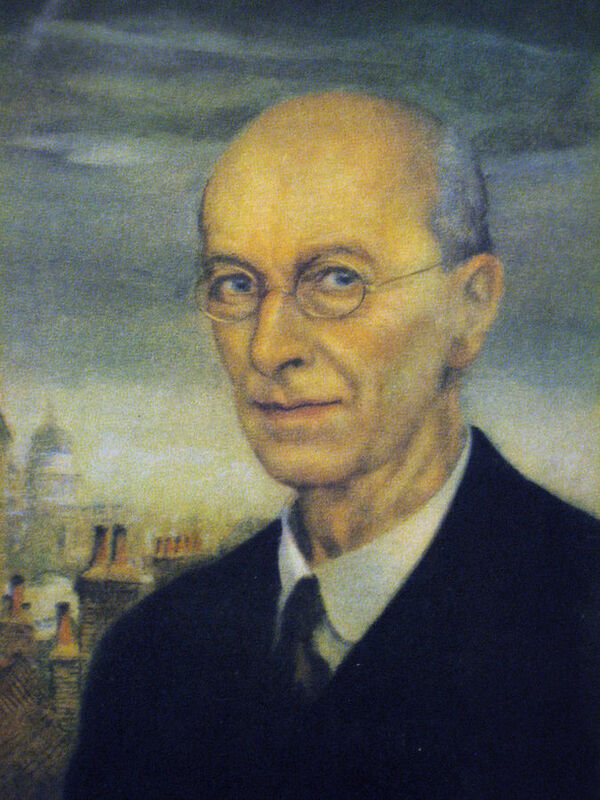 A self-portrait of Arthur Rackham entitled “A Transpontine Cockney”, 1934. “Arthur rackham selfportrait” by Arthur Rackham – Hudson, Derek. Arthur Rackham: His Life and Work. New York: Charles Scribner’s Sons, 1960. 181. Print.. Licensed under Public Domain via Wikimedia Commons. Arthur Rackham was born at 210 South Lambeth Road on 19th September 1867. He came from a big family, his mother Annie having 11 other children though not all survived childhood. He was educated at the City of London School and showed a natural aptitude for art and drawing. In 1884 Arthur became an insurance clerk in the Westminster Fire Office, earning £40pa. This job supported him while he studied part time at the Lambeth School of Art. The first public exhibition of Rackham’s work was a watercolour, Winchelsea from the Marsh, at the Royal Academy in 1888. By 1890 he was regularly contributing illustrations to the Pall Mall Budget magazine. And by 1893 he had resigned from the insurance company to concentrate on his art but this did not stop him acting as a casual reporter and contributed illustrations to magazines and experimented with the new halftone printing process. His drawings for ‘The Westminster Budget’ forms a remarkable record of life and the well-known personalities of the 1890’s. His early work as a competent graphic artist hid his fanciful style which only started to emerge in 1894 with The Dolly Dialogues. He quickly became the prolific illustrator of fantastic fairytale creatures and human like trees and animals leading to a highly lucrative career in book illustration. In 1894 he began illustrating for Chums and Little Folks and other Cassell publications. Later he illustrated works such as Lamb’s Tales from Shakespeare, Gulliver’s Travels, and Grimm’s Fairy Tales. After his marriage to Edyth Starkie in 1903 he was commissioned to illustrate among other things ‘The Wind in the Willows’ , ‘Gulliver’s Travels’, Rip Van Winkle and Peter Pan as well as Alice in Wonderland. Arthur Rackham died of cancer on 6th September 1939 having illustrated over 60 books including the works of Shakespeare, Charles Dickins, James Barrie and Lewis Carroll. Perhaps Rackham’s most distinctive qualities was his eye for detail and gift of imagination and creativity, which he used to tell classic children’s fiction though his drawings. Arthur Rackham one of the leading book illustrators of his day, was born in 1867 at 210 South Lambeth Road. He was the fourth of 12 children of Alfred and Annie Rackham, who had lived there since 1861. Alfred was a senior law court official. Arthur was taught to read and write at home. He loved to draw and paint and showed early talent. At 12 he was enrolled at the City of London School in Cheapside, where he won prizes for drawing. In 1882 the family moved to 27 Albert Square. Having left school at 16, Arthur spent six months in Australia before returning to enrol for evening classes at the Lambeth School of Art (now the City and Guilds School in Kennington Park Road). To earn his keep he worked at the Westminster Fire Office as an insurance clerk. He ended his studies in 1890 and began to earn money by drawing for books and magazines, eventually joining the staff of the Westminster Gazette. Photography was then in its infancy. and most publications were still illustrated with drawings. He was also an accomplished painter and from 1888 he exhibited at the Royal Academy and later at the Royal Watercolour Society, the Royal Society of Portrait Painters and the Art Workers’ Guild. He became widely known in 1900, for his illustrations in an edition of Grimms’ Fairy Tales. Five years later his reputation spread to the United States. with some delightful work in Rip Van Winkle. His distinctive and lively drawings, especially of fairies, gnomes and witches, made him an enduring favourite. Between 1896 and 1939 he illustrated more than 60 books, including works by Shakespeare and Dickens and many collections of fairy tales. In 1903 he married Edyth Starkie and in 1908 they had a daughter, Barbara, whom he often used as a model. He painted self-portraits at various stages of his life, and liked to include caricatures of himself amongst the gnomes and elves in his drawings. He died in 1939, shortly after completing the drawings for The Wind in the Willows. Many of his books have been reprinted since then, and copies of the original editions are rare and valuable. Dulwich Picture Gallery mounted an acclaimed exhibition of his works in 2002. No. 210 South Lambeth Road, where Arthur Rackham was born, was a terraced house with a small garden, on the site of the present Knights’ House, part of the Mawbey Brough estate. It was big enough to accommodate his parents, two grandparents, his numerous brothers and sisters and two domestic servants. In those days the South Lambeth Road was surrounded by greenery. Opposite the Rackhams’ house was the garden of Turret House, formerly known as The Ark, home of the famous 17th-century gardeners, John Tradescant and his son. By the 1870s it was unkempt and overgrown, and may have provided the inspiration for the gnarled and spindly trees that featured in Rackham’s imaginative drawings. Tradescant Road was built over the garden in 1880, when Turret House was demolished. A row of large houses with extensive gardens stood just north of Wilcox Road, then home to a thriving street market. These too would shortly be pulled down to allow the re-routing of South Lambeth Road, eliminating the bend now known as Old South Lambeth Road. The Tate Library was built on the corner of the new stretch of road in 1888, overlooked from the other side by Victoria Mansions. It was a busy trunk road, even in Rackham’s time. He would have seen horse-drawn trams and buses hurrying past his house, taking passengers to the City and West End from Brixton, Clapham and Streatham, then in the throes of their transformation from country villages to crowded London suburbs. Were he to return today, there are two principal buildings on South Lambeth Road that he would recognise. The colonnaded Baptist Chapel, towards Stockwell, was completed just before he was born. The Canton pub (now the Canton Arms), on the corner of Aldebert Terrace, is older – but almost certainly was not frequented by his parents, who were respectable churchgoers. (They attended a chapel in Claylands Road, the building that is now the headquarters of Rolfe Judd, the architects.) The newly-built Aldebert Terrace, originally called Canton Street and then Albert Terrace, led into Albert Square, where the Rackham family moved in 1882, living at no. 27 for three years.